Lumenpulse luminaires were chosen to light a series of iconic Montreal buildings as part of Montreal's 375th and Canada's 150th anniversary festivities. On May 17th, 2017, the Jacques-Cartier Bridge, a Montreal architectural landmark, came to life with a new lighting design, named LIVING CONNECTIONS. This lighting design adapts to the city's changing seasons and the ever-evolving, data-responsive programming creates a unifying and dynamic symbol of Montreal's unique history and creativity. "We are very proud to have helped illuminate these iconic symbols that grace Montreal's skyline," said Francois-Xavier Souvay, Chairman, President and CEO of the Lumenpulse Group. "As proud Montrealers, we felt a great responsibility to make sure we provided an effective, sensible lighting solution that revealed Montreal's splendor bringing forth a new beacon of inspiration to Montreal's sky for years to come." 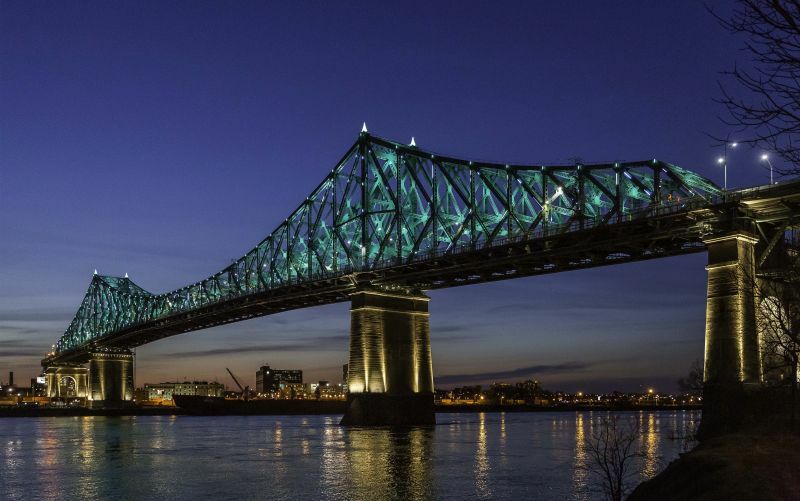 The Jacques-Cartier Bridge's new lighting design was led by Moment Factory, and included the efforts of six more Montreal-based multimedia and lighting studios: Ambiances Design Productions, ATOMIC3, Éclairage Public/Ombrages, Lucion Média, Réalisations and UDO Design. The lighting design used approximately 95 high-performance Lumenfacade luminaires to light the bridge pillars, while approximately 480 durable, high-output Lumenbeam XLarge luminaires, carefully concealed from view within the structure, bathe the interior structure with a uniform wash of color. The project is part of a series of new lighting schemes to celebrate multiple sites across the city, including the Ile Sainte-Helene Biosphere. Created by the firm 4U2C, under the artistic supervision of lighting designer Yves Aucoin, the design enhances the existing lighting system and highlights the structure's strong architectural qualities. The sphere's appearance is constantly changing; various color and intensity schemes are applied to the metallic structure throughout the night. The Jacques-Cartier Bridges now joins the growing constellation of illuminated Montreal landmarks, which include such places as: Place Ville-Marie, the Mount Royal Cross, the Biosphere and the Montreal Olympic Tower. For more information, visit the Jacques-Cartier Bridge website. Founded in 2006, the Lumenpulse Group designs, develops, manufactures and sells a wide range of high performance and sustainable specification-grade LED lighting solutions for commercial, institutional and urban environments. The Lumenpulse Group is a leading pure-play specification-grade LED lighting solutions provider and has earned many awards and recognitions, including several Product Innovation Awards (PIA), three Next Generation Luminaires Design Awards, two Red Dot Product Design Awards, a Lightfair Innovation Award, and an iF Design Award. The Lumenpulse Group now has 670 employees worldwide, with corporate headquarters in Montreal, Canada, and offices in Vancouver, Québec City, Boston, Paris, Florence, London and Manchester. Lumenpulse Inc., the parent company of the Lumenpulse Group, is listed on the Toronto Stock Exchange under the symbol LMP.